American made goods get harder and harder to find but they are still among the best in the world and worth the effort. Support American business and industry. Buy American made with pride. Hanging Saddle Rack - 3 Up! 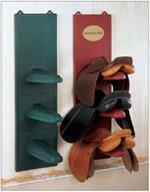 Fast and easy saddle storage. Hold it all, move it all. Created by Caitlin Allen and Jen Gilmour. These unique lamps are made of handmade papers. Unique three horse design trots toward you. Three Sterling Silver horses on an 18"chain. One, Two, Three and on you go. Keep your horse visible while he's turned out. 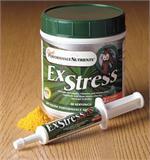 Concentrated formula for horses that tie up. Amino Acid formula for endurance, strength and recovery in a convenient paste. Highly concentrated sugar-free Vitamin E and antioxidant formula. This generic gel tubing provides soothing protection for horses and humans at a reasonable cost. 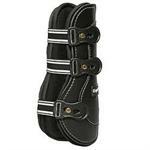 A high performance cushioned saddle pad made in the USA! Herb-free, sugar free calming formula. 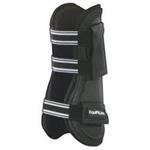 Great Protection with a form fitting lining.